Zep is a simple embeddable editor, with a rendering agnostic design and optional Vim mode. Out of the box it can draw to a Qt Widget or an an ImGui window - useful for embedding in a game engine. A simple syntax highlighting engine is provided, and can easily be extended. Basic theming support is included, and window tabs and vertical/horizontal splits are also available. Zep is 'opinionated' in how it does things, but is easy to modify and supports many common features. It is heavliy influenced by Vim, but has a good notepad-style editing mode too. 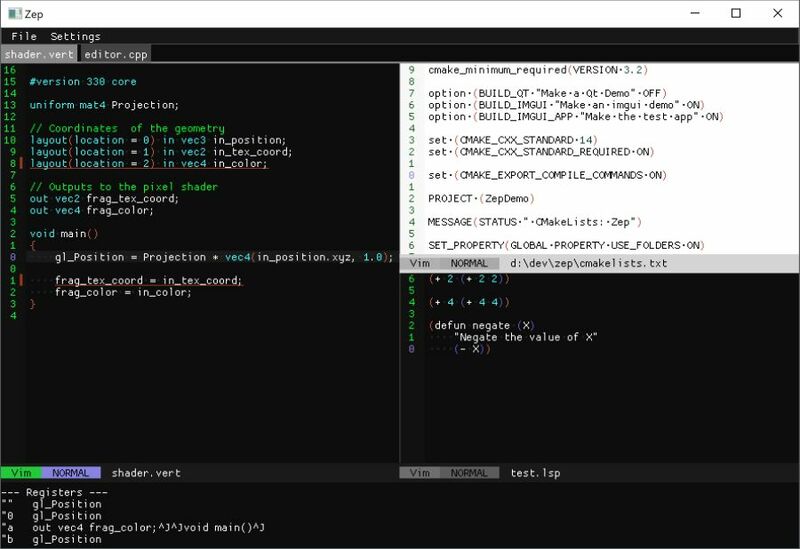 Zep is ideally suited to embedding in a game engine, as an in-game editor, or anywhere you need a simple editor without a massive dependency on something more substantial like NeoVim. The core library is dependency free, small, and requires only a modern C++ compiler. The demos for Qt and ImGui require their additional packages, but the core library is easily built and cross platform. The ImGui demo builds and runs on Windows, Linux and Mac OS. - Modal 'vim' or modeless 'standard' editing styles. - Text Markers for highlighing errors, etc.